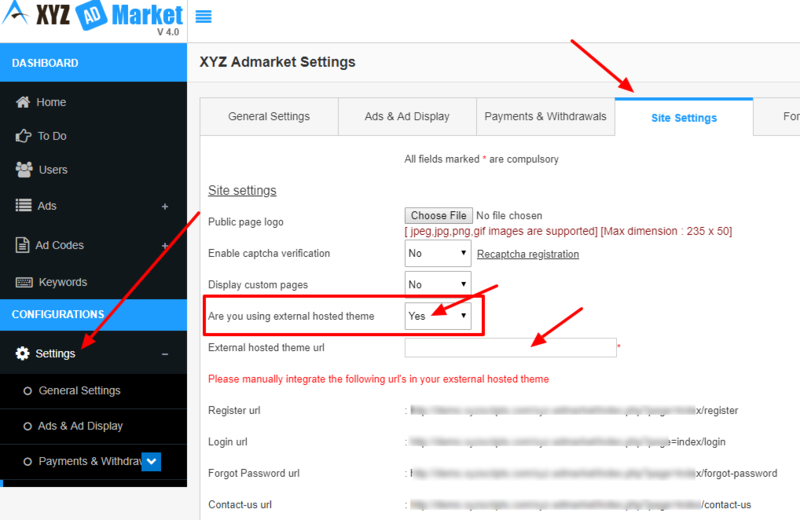 We can use external theme for XYZ Admarket and public can see this external theme. For this we need to use the external theme in root folder and admarket script in a sub domain or sub folder. Now go to the Settings > Site Settings. In the option “Are you using external hosted theme”, please select “Yes”. In the external hosted theme url, please enter the url where the theme installed. Now you can see the register url, login url, forgot password url and contact us url. Please add these links in your external theme for Register, Login, Forgot Password and Contact Us options. When a user come to your site, they can see the external theme and they are redirected to the user dashboard on login and register. ← How can I refund to advertiser?